Personal sensor for remote monitoring health parameters of man. Data are read via Bluetooth Low Energy communication. The device has a feature of the remote upgrade of its firmware. This device was designed and programmed according to low energy requirements. Own electronic design and program were developed; the device is built using BlueNRG-2 chip from ST Microelectronics. During development of the device, wake up problem was discovered. This BlueNRG-2 chip issue was carefully tested and analyzed. Serial link over Bluetooth (RFCOMM) connecting the Raspberry Pi 3 board with other devices (laptops, smartphones, etc. ; OSes: Windows 7, 10, Linux, Android ). Bluetooth configuration, stack communication monitoring. This task will be applied in remote configuration and control embedded devices from mobile devices. Gathering documentation sparsed in Internet about Broadcom VideoCore IV chip; Details of early boot stages (before Linux start); testing Raspberry Pi 3 boot time; Preparation for using Raspberry Pi GPU for parallel calculations. The knowledge about VideoCore IV may be also applied in implementation of specific fast tasks after power on the board before Linux has been started. Code Review of Smart House System. Evaluation of the system architecture. Consulting of multitasking synchronisation solutions. Real-time system drivers for serial communication and high quality sound playing. a) Development of Custom Operating System for Embedded Devices: e.g. C extension (in C preprocessor) that simplifies usage of cooperative multithreading, objects for synchronization and communication of the threads, etc. The Bootloader designed to support safe upgrade of the operating system located on HDD partition (for x86 architecture). Automatic return to last version in a case of failed upgrade. Start of a safe system version when configuration data or other critical issue is detected. Design and development automatic testing (regression testing) of bootloader behavior on low level before operating system has been started. Tuning and preparation the system for automotive computer NexCom VTC-1000. Analysis and solution a problem with touchscreen calibration NexCom VMD-1000B (PenMount PM6000 chip). Participation in the 7th GENIVI Conference, All Member Meeting, Shanghai. Review of the architecture and source code of the library. Propostion of changes and improvements. Development of applications devoted to testing positioning (uses 433 MHz band). Review of the Dash7 preliminary standard specification - low power wireless communication. Membership in Dash7 Technical Working Group - discussion of new solutions for header FEC coding, compatibility with previous versions of the standard. Participation in Dash7 Alliance Meeting in Helsinki. Evaluation of the toolchain building tools (e.g. crosstool-ng). Evaluation of firmware building tool (buildroot). Implemenation of improvements in the Linux patching. Application of the Linux extensions (RTAI) for real-time systems with the real-time hard constrains. Tuning and preparation debuging tool LTTng for the Linux kernel with RT_PREEMPT patch. Linux with root file system protected from unexpected power off. Design and application of changes in Linux for IEI Wafer LX800, that introduce read-only root file system. This provides protection from unclean closing of the file system during sudden power off. Other data, that is variable at the system running time are stored in RAM (tmpfs). Porting to new platform the software responsible for the wireless router (WiFi/3G) management and statistics reporting. Tuning the operating system, inluding changes in partitioning the flash memory - optimization for space occupation, selection of proper filesystem type, usage of separated partition for configuration data. The controller for CNC router on Intel Atom mainboard running under operating system has been developed. Architecture of the device was designed, next the firmware was developed together with low level hardware support parts. Software consist of the system drivers and control application, that worked as server and provides control interface over Ethernet. The software has multi-thread structure and satifies real-time requirements. Linux for IEI Wafer LX800 embedded board. Boot time optimization, efficient graphic user interface of the system. Support for LCD Touch Panel. The system boots faster than Windows on this board. Co-operation in the design and development of the WiMAX Base Station (IEEE 802.16): design of the device architecture, development of the algorithms for bandwidth allocation for connections, optimization for short run-time and real-time characteristics, hardware control, analysis and debugging of the complex hardware issues in system using advanced testing methods. Coherent testing and debugging of software and hardware. Development of the methods and tools supporting this type of system evaluation. The base station devices were ported to multiple embedded platforms (architectures: x86, ARM, xScale, PowerPC) and were used specialized RF modems that included custom ASIC and FPGA chips. The systems worked under control of the Linux with RT_PREEMPT patch. The low power measurement device for counting transmission and consumption of a fluid that remotely sends recorded data to a server via GPRS. Specification of user requirements were described, followed by object analysis and creation of UML models. In next step, created documents were a basis for design of the device architecture. In development phase we provided consulting services for programmers that implemented the code. Their work was continuously evaluated by performed source code inspections. The system used MSP430. The research devoted to embedded systems: automatic code generation for state machines, formal description of the system behavior. Design of the Embedded System Laboratory for the Institute of Electronics, Technical University of Lodz, Poland. The tasks were performed on self manufactured platform with Atmel Atmega128 microcontroller, equipped with keyboard, LCD display and other peripheral modules. The courses present basic problems in programming of the stand-alone embedded systems. The controller of the 3-axial CNC machine. Design of the hardware (including PCB), prototype development, design and development of the firmware responsible for stepper motor control, path interpolation and effective dynamic movement. The accompanying software runnign on PC for device control were developed. The software among other functions, is an implementation of milling projects processing and 3D visualization. It recognise various input data formats: HPGL, DXF and Gcode. The device played audio advertisement when a person was passing by. The devices was organized in network and were controlled via TCP/IP connection established over GPRS. The audio files and schedule were remotely updated. Co-operation in: user requirement specification, code review and optimization; the development of the reliable download. Downloaded contents was taken from a server and programmed in real-time into local FLASH memory. The controller of the 3-axial thermal cutter: design and development of electronics, prototype PCB, the firmware and user software, development of algorithms for drawing processing. The real-time motion control achieved by driving 3 stepper motors, with specific demands for the dynamics. The requirements were determined by physical process of material evaporation. 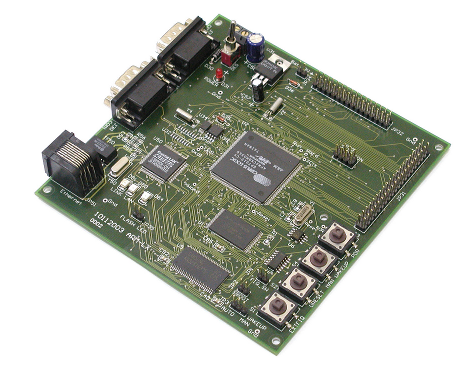 The design and testing the universal development board that contained ARM7 processor, Ethernet controller, memories (flash and sdram) and other peripherals. The development of a set of programs written in assembler for testing and verification of the basic items and functions of the board (inc. FLASH programming, access to SDRAM using MMU, boot-loading, etc.). The board was designed to run under Linux. The electronics, PCB and the firmware design and development of the device connected to PC and built on i80251. microcontroller. In the real-time, the device generated two analog ECG signals, that were reconstructed from digital representation stored in signal data base on the PC. The device was intended for elctrogardiographs testing. Special measures, including theoretical analysis, were taken for minimization of distortion during signal reconstruction (DSP operations, resampling, sinc correction, analog filtration). The development of the software PID controller, applied in high power converters. The design and implementation of the fixed-point arithmetic library with error analysis. The code was written in assembler for Intel 80552 microcontroller. Participation in scientific research that tested an application of the neural networks in identification of dynamic system parameters. The calculation of the network classifier were optimized for short execution time. Critical parts were programmed in the Pentium assembler with consideration of two pipelines of the processor, resulting in dose or more increase of calculation speed.